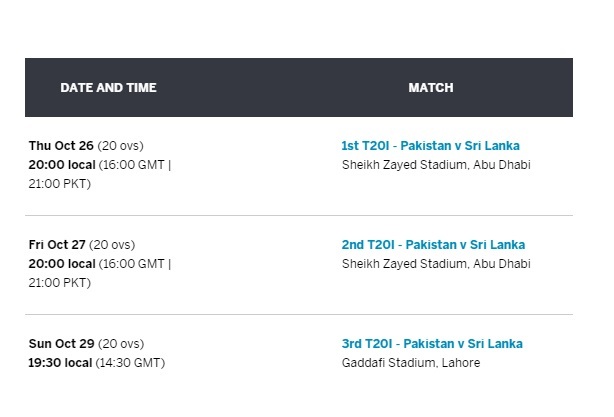 Sri Lanka will play three T20 matches against Pakistan & the third & final T20 match will be played at Gaddafi Stadium Lahore. Sri Lanka cricket board announced that the team will tour Pakistan after the first two matches that will be played in UAE. Thisara Perera will lead Sri Lanka in T20 series against Pakistan. For the first time Sri Lanka are visiting Pakistan for the third T20 since the terrorists attacked on their bus when the team was on their way to Gaddafi Stadium in March 2009. Sri Lanka will still tour Pakistan despite coach Nic Pothas & top players are ruled out of the T20 squad due to security reasons. Sri Lanka cricket chief Thilanga Sumathipala said "Nic has not told me he is not going,". "We are going to be in Pakistan for just over a day, but it is very important for us to go there and revive international cricket in South Asia." No major team visited Pakistan after the terrorist attack that left 8 dead & 7 injured including players & support staff. Players are dropped from the T20 squad who would not travel to Pakistan. The players include Skipper Upul Tharanga, Lasith Malinga, Suranga Lakmal, Niroshan Dickwella Chamara Kapugedara were ruled out of the T20 squad. Lakmal and Kapugedara were in the team bus & survived the terrorists attack. Thisara Perera was included in the World XI squad that played three match series against Pakistan in September. Pakistan whitewashed Sri Lanka 5-0 in ODI series. The first two T20 matches will be played in Abu Dhabi on 26 & 27 October while the last T20 match will be played in Lahore on 29 October 2017.